- Wicked? or Wise? Two witches greet the moon as it rises in the midnight sky. Adorable for Halloween, or any time of year. Simple to stitch, with just two colors of floss. Design measures 65 stitches high by 81 stitches wide. Do you have any other questions about our "Wicked?" 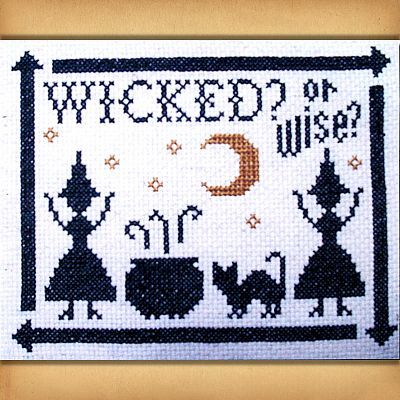 Cross Stitch Pattern? Is that even a question? Another cute, easy project, done in short order. Cute, small & quickly done!